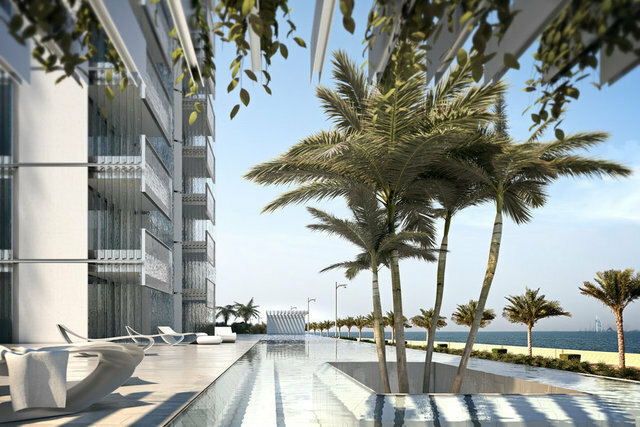 Situated on the iconic Palm Jumeirah Island, this three-bedroom apartment in the Muraba Residence has set the standards high in Dubai. The apartments we have created are designed with a certain sensibility in mind. A considered visual aesthetic, but also a conscious desire to create a positive ambience; a connection with the environment that may not be entirely tangible. To look out across the horizon is always inspiring. To watch the sun rise over the city–your city–can energise your thoughts and crystallise your intuition. Light is an integral element; how it behaves throughout the day; how it moves through the rooms. Open, but without compromising privacy. To be at home is to be entirely at ease with your surroundings. The space, the flow, entirely in tune. Ultimately this is what we would like you to sense in our design. Living room: Floor-to-ceiling windows make the most of the panoramic views across the Dubai skyline, and create a minimal transition between interior and exterior spaces. A key part of the building’s design is to balance maximum visibility with the requirements of each resident’s privacy. This is achieved by incorporating an innovative louvred glazing system into the exterior of every facade. It allows each resident to make the most of the vistas, whilst restricting the view into the apartment from other angles. Kitchen & dining areas: Clean lines, open spaces and the careful consideration of light are the main themes of the interior layout. Each part of the apartment flows almost seamlessly into the next. This means that, although each area has a clearly defined functionality, the sense of connection with the whole space–an holistic living experience–is never lost. Master bathroom: Careful attention to detail creates a space that is contemporary and yet intimate. The challenge was to maintain the feeling of lightness and open-ness experienced in the rest of the home, whilst affording privacy when required. This has been achieved by focusing on the quality of line, texture and the introduction of light as a key design element. Each feature has been deliberately chosen to create a space that is at once ‘of’ the apartment, and yet separate.